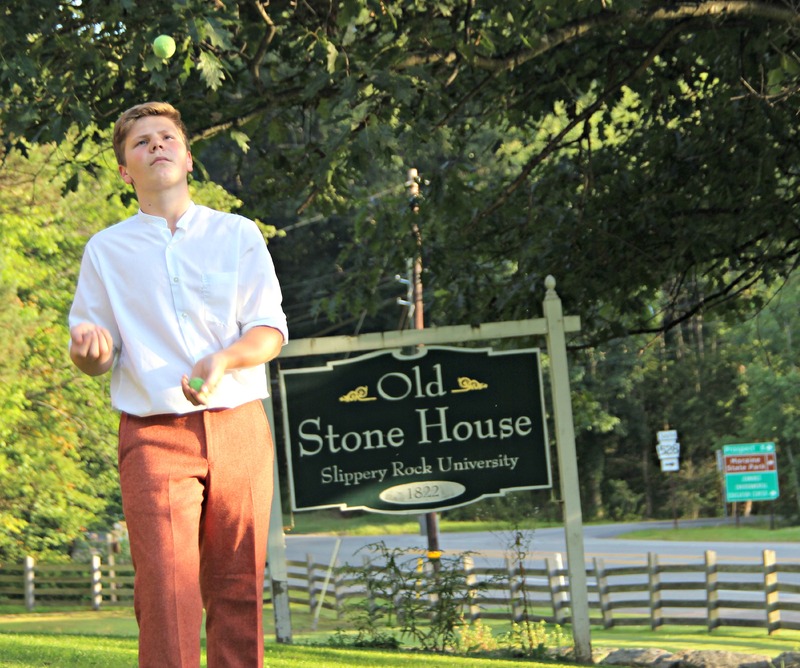 THE OLD STONE HOUSE IN SLIPPERY ROCK, PA.
On a splendid August 29, 2014, evening my husband Monte and I attended an original one-act play, The Stone House, written by Kevin Lukacs. 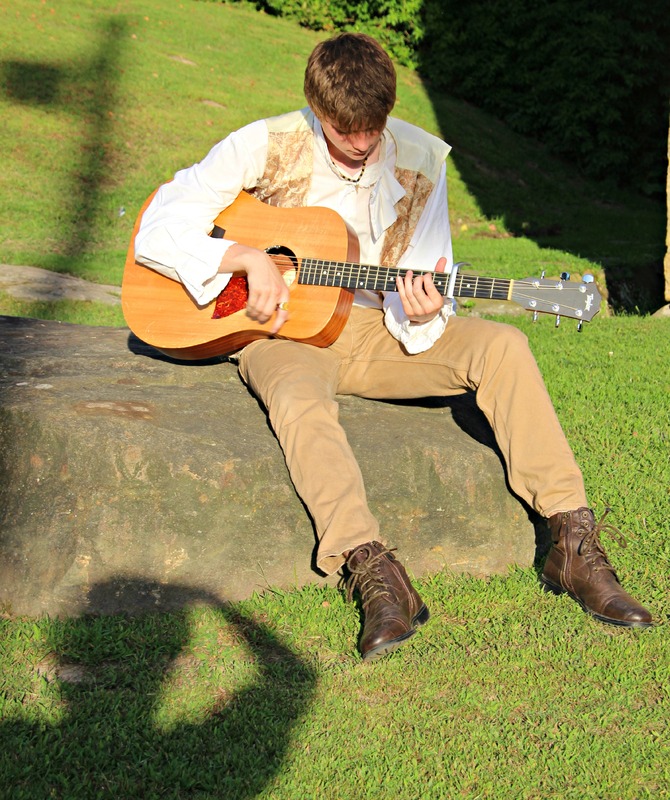 This work of art was performed at the Old Stone House Inn in Slippery Rock, Pennsylvania, an 1822 stage coach stop between Pittsburgh and Erie. 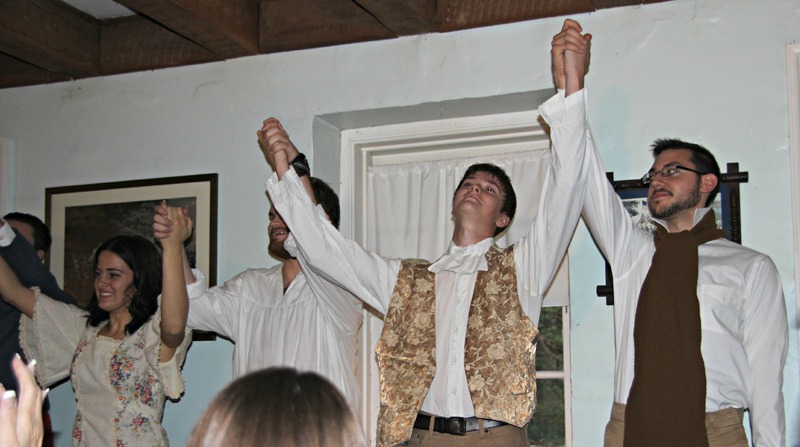 It was performed by members of the Butler Little Theater in Butler, Pennsylvania. When Adam and Eve after they sinned in the Garden of Eden God had compassion on them, and offered them garments made of fig leaves. Ouch! The underside of the leaves were like rough sandpaper. Later they made garments from something more sturdy: animal skins. Fast-forward to the early 1700s. One of my ancestors, Patrick Googins, tradition says, came from Ireland at an early age, about 1720 A woolen weaver by trade he entered the service of William Pepperrell, at Kittery, Maine. Fast-forward again to the late 18th century and early 19th century. By this time the assortment of garment fabrics had proliferated. The Diary of Martha Ballard, 1785-1812* mentions many of the fabrics used in Maine during this time period. A glossary at the end of a modern-day reproduction of Martha Ballard’s diary lists many—if not all—the different fabrics Mrs. Ballard mentioned in the 27 years of her written history. How many of these fabrics have names that are foreign to you? I was surprised to find 15 fabric names I never heard of, even through my many years of sewing. The terms below, most frequently used by Mrs. Ballard, was compiled through a variety of printed sources. 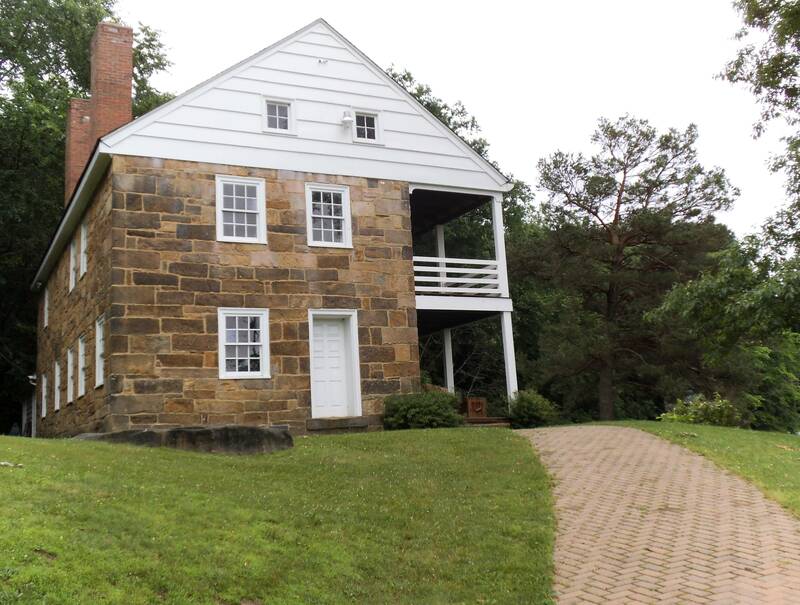 THE OLD STONE HOUSE Part 1: SLIPPERY ROCK, PA. Recently my husband Monte and I found ourselves passing the Old Stone House at the intersection of Routes 8, 173, 528 in Pennsylvania. On previous trips to Slippery Rock the historic site was closed. This time the parking lot was almost full. Since I wanted to take some photos of historic sites in Butler County (for a contest) we stopped. Monte waited in the car while I walked to the former inn’s entrance. I saw a group of persons gathered around a table in the window by the porch end—obviously, I arrived during a meeting. A young man left the meeting to greet me. Yes, I could walk through and take pictures. 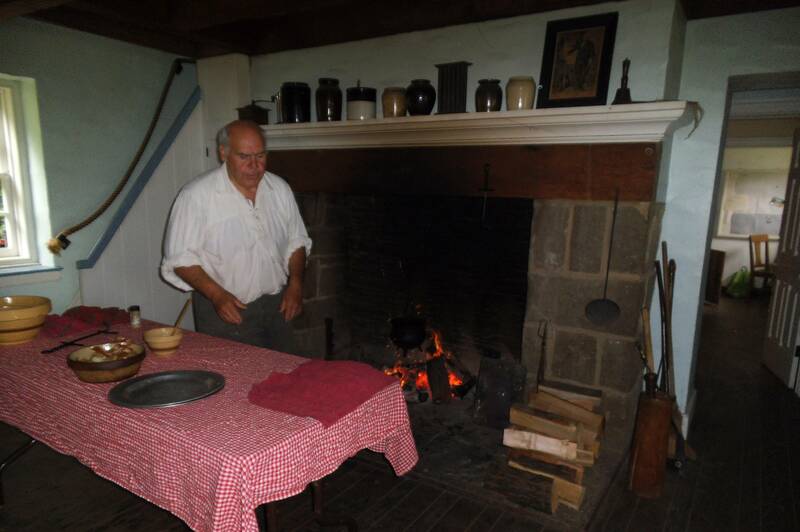 A man was cooking over an open fire in the fireplace. “We have free soup and ham sandwiches,” he said. Of course, I figured it was mainly for the meeting attendees, and after talking to him a minute I continued on. Upstairs I joined a tour group. 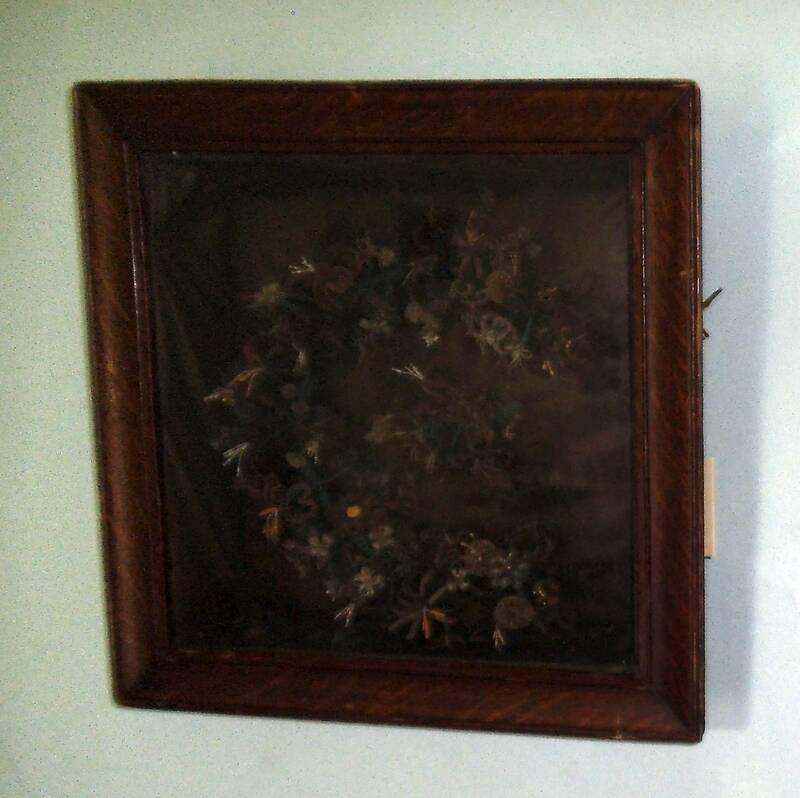 I continued taking photos as he described a framed picture made from human hair, probably gathered at funerals or from other places. He pointed out a framed picture of a dog without a leg, and said that owning pictures was for the wealthy, and sometimes persons purchased pictures, no matter what the subject, just to mimic the rich. He also said there was a brief time of prejudice against Germans, during which German guests had to sleep outside. There was a mid-1800s map in the third room. On the outside upstairs patio I turned my camera on the scene below. 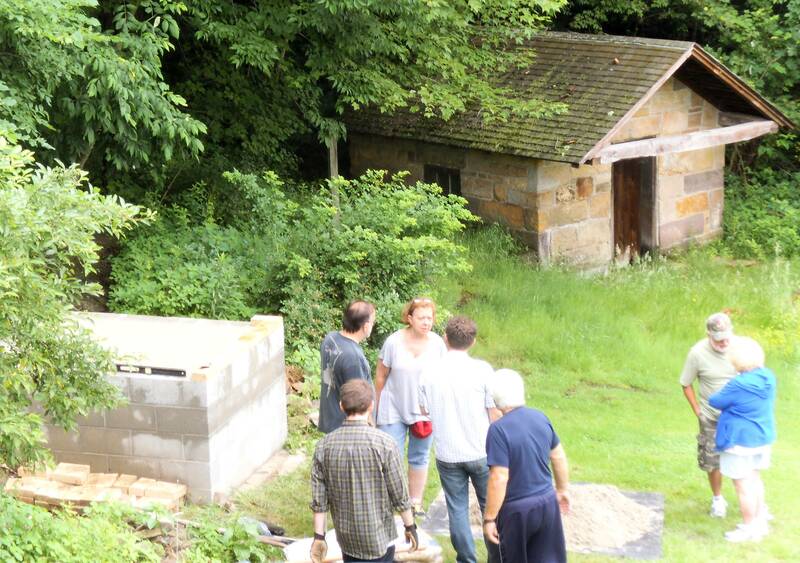 The docent—a Slippery Rock University history student—said the Old Stone House activity for this day was building an old fashioned outdoor oven. Returning to the grounds I walked over to the construction project. “Would you like to set a brick?” I was asked. I said I would, but would return as I turned to go get Monte. It’s an ever-changing never-defeated religious folk art gallery, a historical and architectural monument in an unlikely place that attracts people savoring its peace, spirituality, authenticity, and sacred nature. 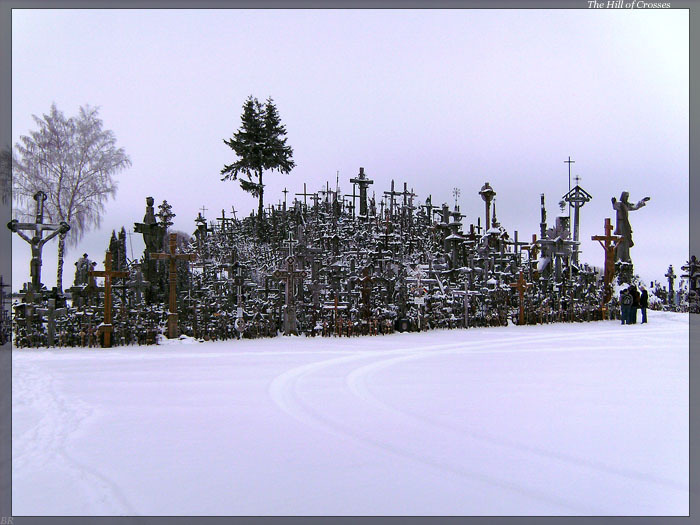 The Hill of Crosses (Kryžiu Kalnas) is a stunning complex that consists of thousands of crosses of various materials and sizes brought and left there by the people, mostly Lithuanians. An oblong mound, once the location of a castle of Semigallian tribe (until it was burned down by the Crusaders), sits next to a former ancient village dating to the 13th-14th. The mound, somewhat similar to a saddle, stands on a plain surrounded by the valleys of Kulpė Stream and its nameless tributaries. It measures only 8-10 meters high and 40-50 meters wide. The Jurgaičiai-Domantai mound, located in the countryside 9 miles outside the small northern Lithuanian city of Siauliai, is covered with crosses. Many crosses appeared after the Virgin Mary and baby Jesus appeared on the mound in the 7th decade of the 19th century. It was Mary who supposedly encouraged people to put crosses at this place. Crosses first began to appear at this spot in the thirteenth century, shortly after the city of Siauliai was founded in 1236. The city was controlled by Teutonic Knights during the 14th century. The tradition of placing crosses seems to date from this period and may have risen as a symbol of Lithuanian defiance toward foreign invaders. The first crosses were erected on the hill by the next-of-kin of the rebels who fell in the 1831 rebellion against Russia. Family members were not permitted by the Tsarist reign to pay proper tribute at the graves of their relatives. 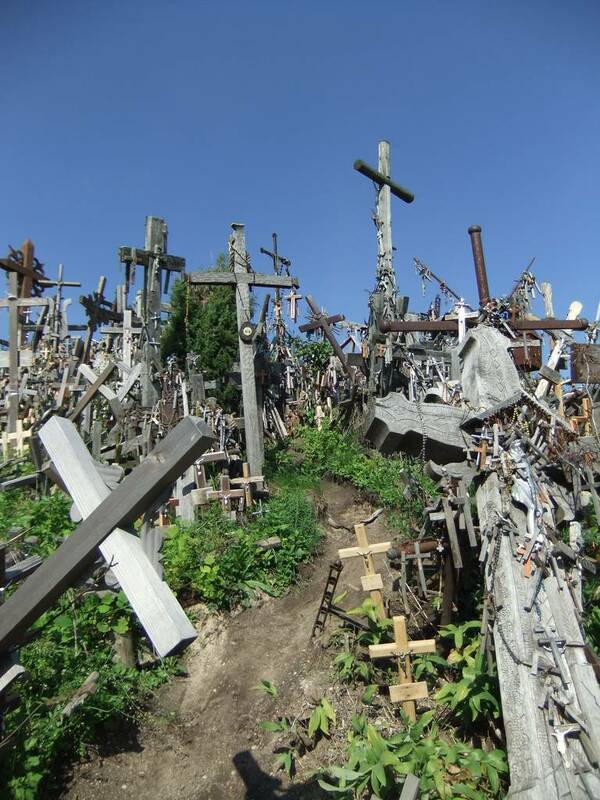 The Hill of Crosses became a place of vows. NOTE: I reviewed Acadia history to determine what effect, if any, it had on the real characters in my novel Intertwined Love. One family (my ancestors) relocated to Downeast Maine before 1769. Often the sources were confusing or conflicting. If you note any errors in this article please let me know in the comment box at the end. This land was well known in European seaports: France, Spain, the Basque country, Portugal, and West Country England. In 1524 Giovanni da Verrazzano, a Florentine explorer serving the King Francis I of France, designated the entire Atlantic coast north of Virginia as Arcadia. The name Arcadia may have been inspired by classical Greek poetry or it may have come from a Micmac word, rendered in French as “cadie,” meaning a favorable piece of land. In 1534 King Francis I of France sent Jacques Cartier—with two ships and sixty-one men—to seek a northwest passage linking the Atlantic, above the continent of America, with the Pacific. Cartier. After discovering the inlet of the St Lawrence river, raising a cross with the royal arms on the Gaspé peninsula, and naming the region New France, Cartier returned to France and claimed New France for his king. An attempt to found a colony came to nothing. To finance colonization, the 1588 French King granted North American fur trade monopolies. Pierre du Gua de Mons (a.k.a. Sieur de Monts) received a trade monopoly between the 40th and 60th parallels (Maryland to Alaska), with the understanding that he establish a colony there. Samuel de Champlain sailed from France, on April 7, 1604, with more than 100 colonists in a fur-trading expedition led by Francois Grave Du Pont, who received a fur trade monopoly in New France from” King Henry IV. In New France, Champlain selected an island in the St. Croix River, which he named Ile Sainte-Croix (holy cross). There he established the first successful European settlement in the New World. He too claimed this settlement—plus Maine and south to the Hudson River—region for the King of France. 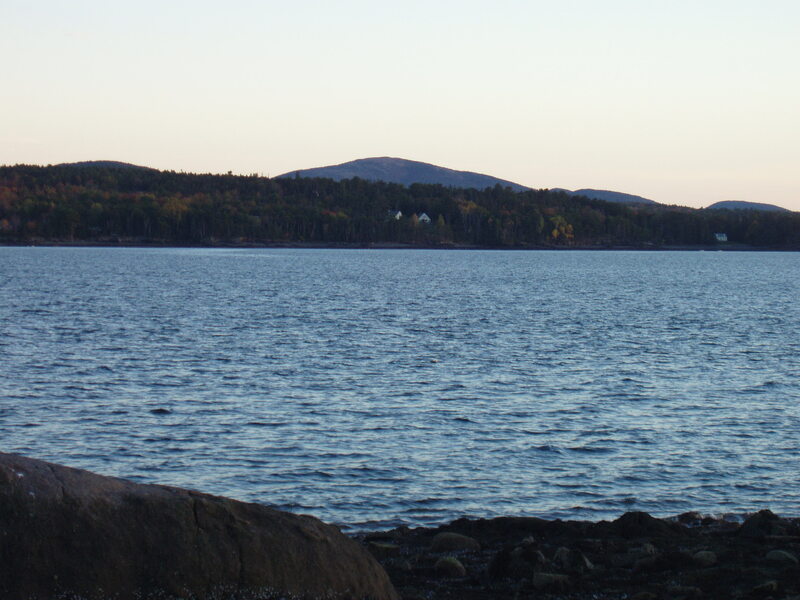 Champlain became memorialized as the “Father of New France” and “Father of Acadia. 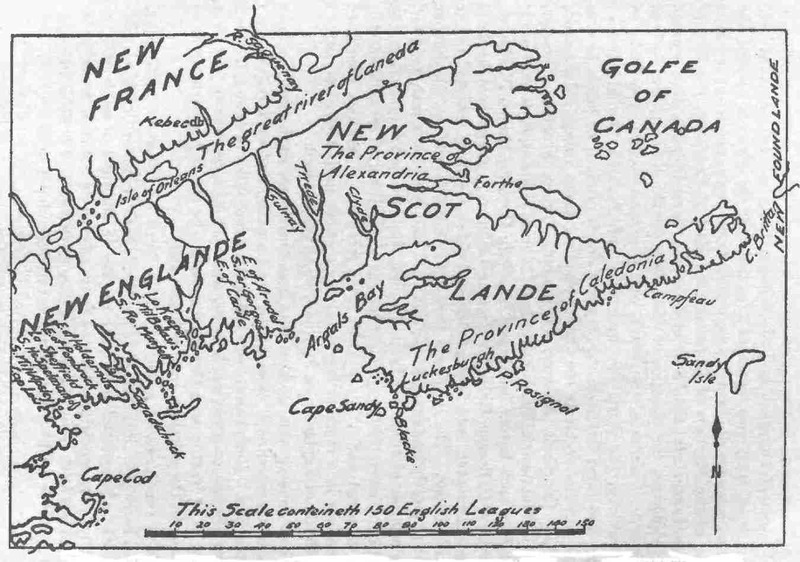 After nearly half of the colonists died (and others suffered dangerous illnesses) during the first winter, the colony moved to Port-Royal on the Bay of Fundy (in present-day Nova Scotia). There the settlers cleared and cultivated land. Pierre du Gua’s monopoly, not having sufficient income to justify continuing to supply the colony, was revoked in 1607. 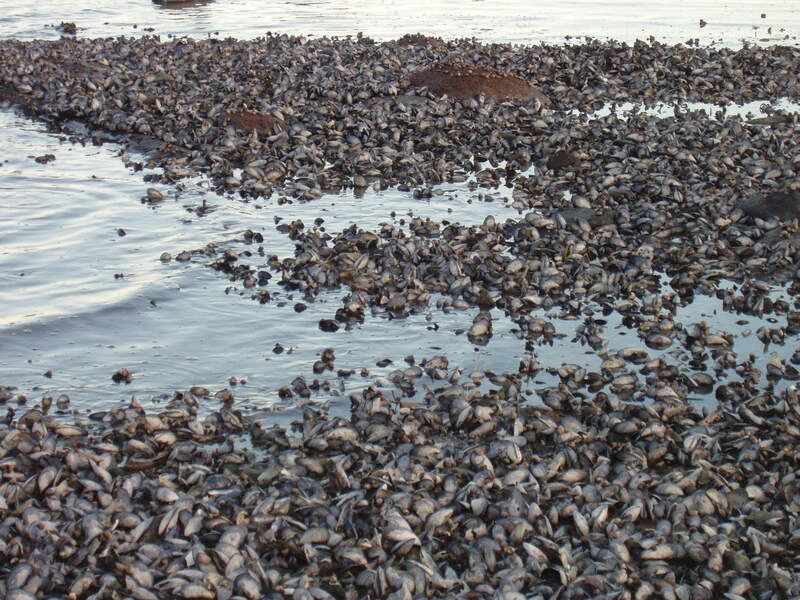 The colony was abandoned—the last Acadians left Port Royal in August 1607. Pierre Du Gua (1558-1628), financially ruined, sold his proprietary rights to the Jesuits. Today, the 150th anniversary of Abraham Lincoln’s Gettysburg Address, is also the 70th anniversary of a period of time that school children in Illinois pooled their pennies to purchase the Everett copy of that speech. The school children sacrificed their movie money and candy money for the cause, to raise the majority of the $60,000 needed to purchase one of the five known copies of the 272 word speech written in Lincoln’s hand. I can attest to the fact that dealing with original documents has the effect of “acquiring a piece of history.” I’ve had the opportunity to handling such documents at the American Antiquarian Society (AAS) library in Worcester, Massachusetts; the Historical Society of Pennsylvania in Philadelphia, and the Lemoyne House in Washington, Pennsylvania. 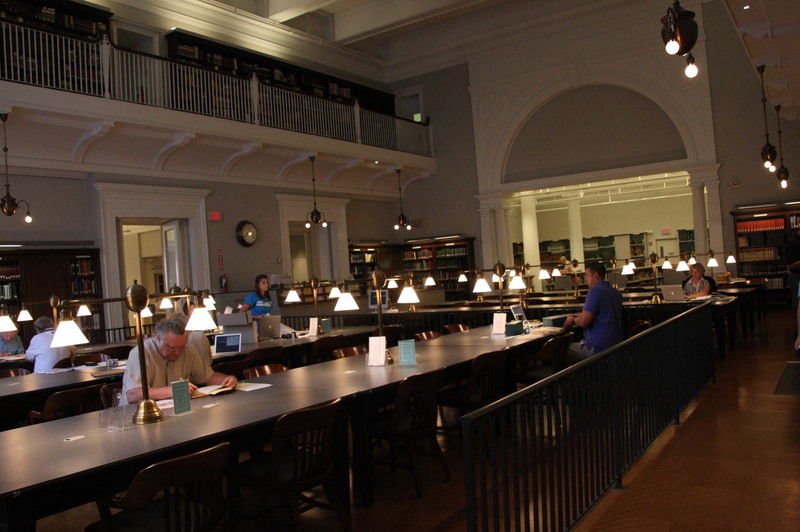 For the AAS and the Pennsylvania Historical Society you had to demonstrate a legitimate research project and participate in an orientation before being allowed to enter the hallowed halls to handle documents in the 1990-1824 time era of my under-construction historical romance novel. I’ve handled documents on handwritten parchment, on paper so thin as to make them unreadable because the black ink produces a double exposure effect. Some of the documents have beautifully handcrafted script, while others may be totally undecipherable. Old original deeds in the Ellsworth Maine courthouse have similar characteristics. NOTE: Wednesday was Fred Ferry’s the last day. due to high Monongahela River water. “It’s too bad you read the newspaper,” my husband told me this August 28, 2013, morning as I did my morning wake-up ritual, reading the newspaper while sipping a mug of coffee. He was referring to a May article I read stating that the historic Fredericktown Ferry would have its last run on September 3, our 47th anniversary. “Wouldn’t that be a neat way to celebrate?” I commented. Sporadically through the summer I attempted to learn the last run schedule. I discovered the September 3 date was set not considering that it was after Labor Day weekend. Fred the Ferry would likely have its last run on the Friday before the weekend. So our question became—Should we wait until Friday for the historic last run or should we join the party on Wednesday?—because going on our anniversary wasn’t an option. But we could celebrate early. On Tuesday evening I decided I’d had it sorting and filing papers and suffering through a dental appointment. I raised my hands, saying Let’s blow caution to the winds and go. Neither our daughter nor a couple friends could make it either day. However, our good friend Lois made a last-minute change in her day off joined us. The sky began shedding gentle tears on Tuesday evening as I went to bed at midnight. A little after 1:00 a.m. I heard a dreadful sound. The gentleness of the tears had turned into sobbing, an emotional outburst of raindrops pounding our roof accompanied by a tympani of thunder. At 4:00 and 7:20 a. m. the sky’s tears still flowed amply. Monte said the tears would stop between mid-morning and 1:30 p. m. when more rainfall was predicted. We left the house at 9:52 a. m. The sky, overcast but its tears no longer falling, was hanging on by an emotional thread, ready to break down at any moment. We picked up Lois as Ligonier’s Heritage United Methodist Church bells joined the Ligonier Town Hall bells in ringing in the hour—10:00 a. m. For better or worse, we were going to meet Fred for the first time on one of his last rides across the Mon River. Our decision was based on both our anniversary and on the fact that Fred was born in 1790, the same year a group of French emigres crossed from Alexandria, Virginia to the town they were founding, Gallipolis. 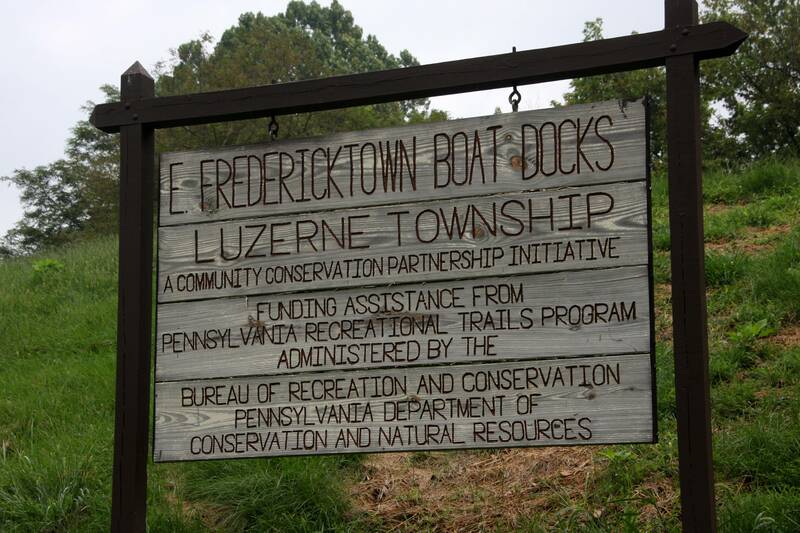 They traversed the Nemacolin Indian trail to its end at Redstone (Brownsville), a few miles upriver from Fred Ferry. 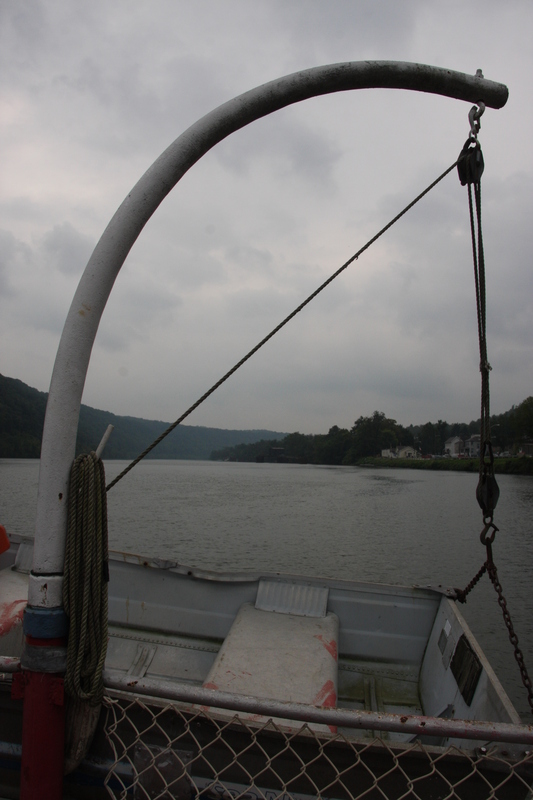 They then traveled up the Mon River to the Ohio River and on to Gallipolis. I’ve researched this because it is a part of the historic romance novel I’m writing on 1790s land speculators Gen. Henry Jackson and William Duer. 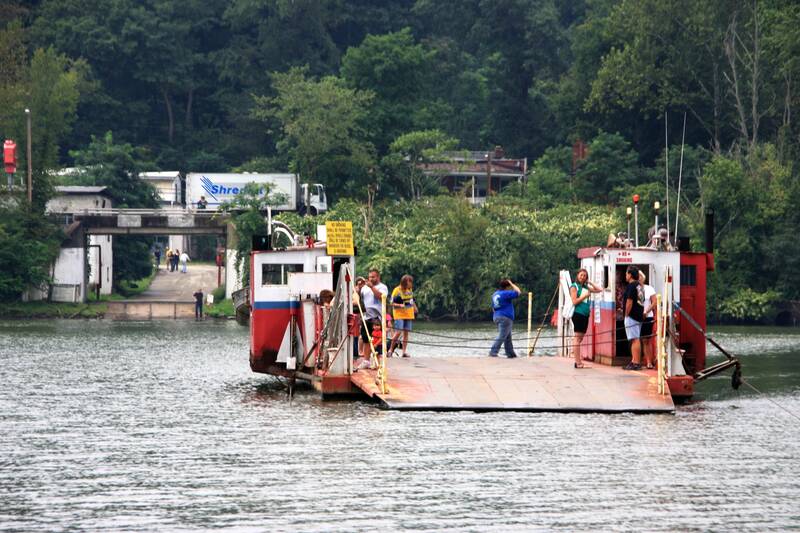 The Fredericktown Ferry, 30 miles south of Pittsburgh, is the last of three original ferries to run across s 400 foot wide section of the Monongahela River between Fredericktown, (Washington County) and La Belle (Fayette County). 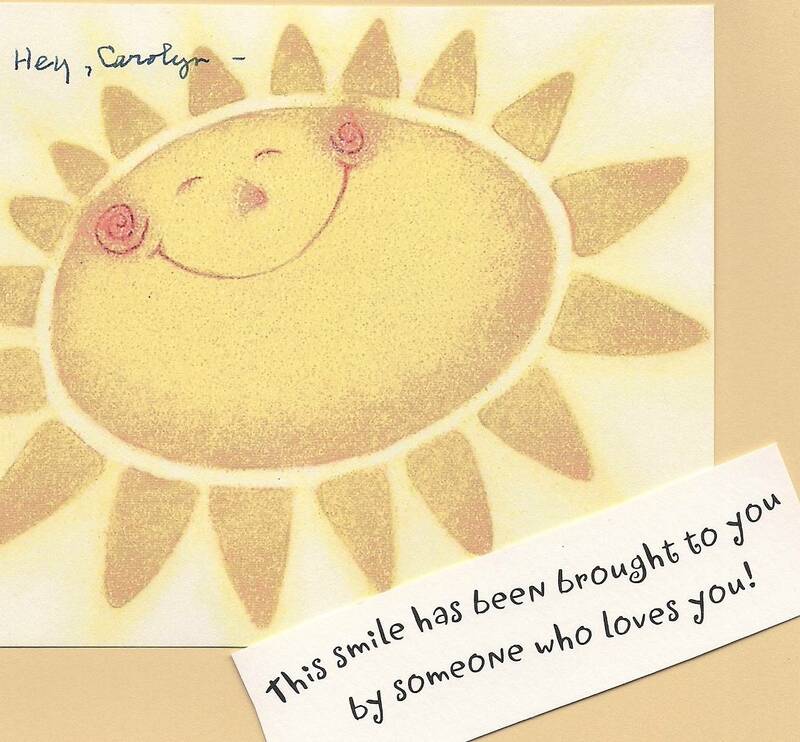 This smile was sent to me one year by my friend Peg. Place it on your face, and if you see someone without a smile give them yours. Warning: Do Not “Smile Someone” Today! My family roots extend deeply into the coastline of Maine, extending from Kittery in the south to East Lamoine in Downeast region. But what if Thomas Coram, an English Sea Captain, had been successful in founding a colony between the Kennebec and St. Croix rivers on one side and the St. Lawrence and the Atlantic Coast on the other side, in a philanthropic venture?2 Would we then be visiting the northeast Atlantic coast in Georgia instead of Maine? In 1702 Europe entered a dynastic war, the War of the Spanish Succession. Although the detailed development of the war is very complex, the basic aim is clear. Both France and Austria were attempting to take control of the territories which made up the bequest of Charles II, the king of Spain, who was childless and had no cousins in the immediate Spanish Habsburg line. Question: What do Bernie Madoff and William Duer have in common? Answer: Both were once respected investors forced into insolvency resulting in stock market (money) deterioration and the collapse of dozens of their investors. Question: What does Timothy Geithner have in common with Alexander Hamilton? Answer: Geithner is the current Secretary of the Treasury of the United States. Hamilton was the first Treasury secretary. History doesn’t always repeat itself, but it is often said to rhyme. Duer and Madoff reflect the root problems of two sudden and dramatic declines in the value of bank stocks: excessive greed. While Madoff’s name has been sufficiently newsworthy that most Americans recognize his name, Duer is relatively unknown to many of today’s citizens. I came in contact with him because of his land speculation in Ohio and Maine. The Ohio speculation was done under the guise of the Scioto Associates, a group of military and political personages hoping to make money off the post-Revolution land in Ohio. 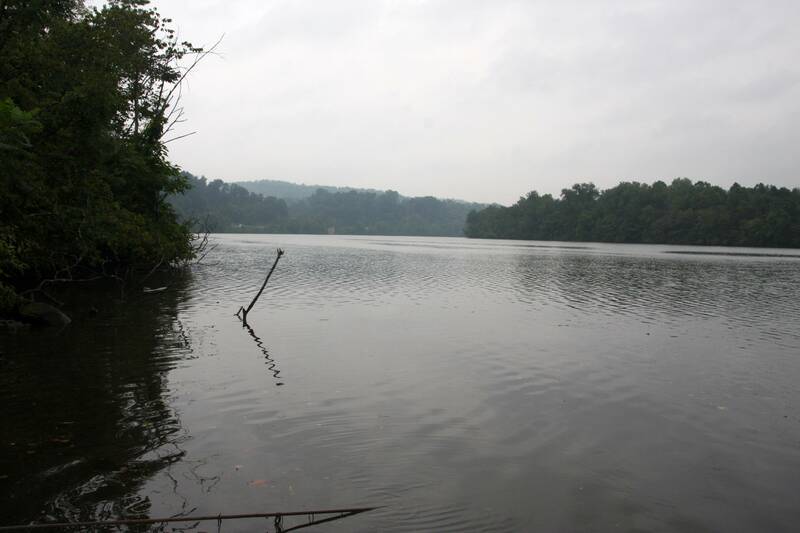 Duer managed to help a “secret” group purchase a huge tract of land along the Ohio River. Ultimately, Duer, along with Gen. Henry Knox, were responsible for the original French settlement at Gallipolis by a group of French émigrés. When the Scioto land speculation went foul (another story) Duer and Knox managed to purchase two million acres of land in Downeast Maine. In the midst of all this Duer was involved in manufacturing and banking speculations. All the speculations went far beyond his means and resources. The multiple speculations he was involved with brought his downfall and, had it not been for Alexander Hamilton’s intervention, it could have destroyed the new country that had yet to reach its toddler age. William Duer was a prominent patriot who served as a member of the Continental Congress, a New York judge, and a signer to the Articles of Confederation. After the Revolution, Alexander Hamilton appointed Duer as assistant secretary of the treasury. In December 1790 Hamilton proposed the establishment of the Bank of the United States, a federally chartered but essentially private corporation. The charter was passed by Congress in February 1791, and on February 25th was signed into law by President George Washington. 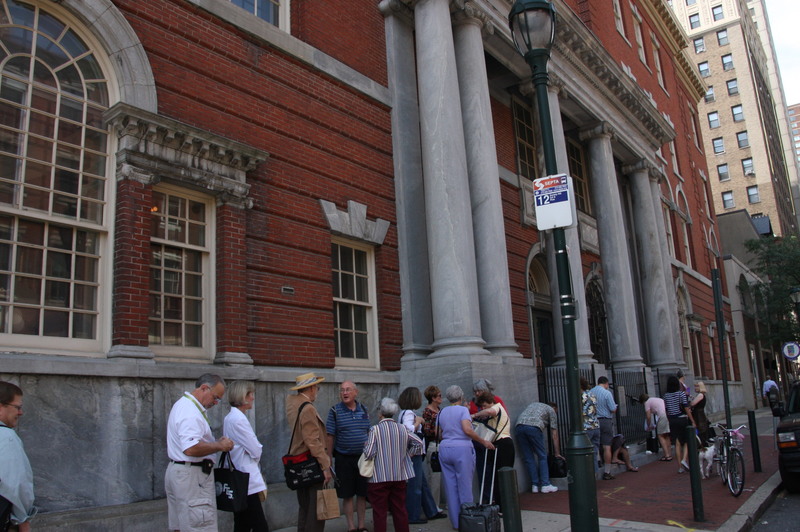 In July of 1791 the bank’s stock subscriptions (scrips) went on sale. They sold out within hours, so quickly that many would-be investors could only try to bid them away from those persons who were fortunate enough to have obtained them. The demand was so high for scrips that a frenzied borrowing and buying occurred. Soon the scrips’ selling price doubled, then went even higher, and people borrowed money to purchase them. In October 1791, the stock holders of the Bank of the United States held an organizational meeting, which Duer attended. He was elected to a committee to prepare the bank’s by-laws.